Requests, for services for a child, which will be in the form of a referral. When professionals refer into LA children's social care, they should state if there are any pre-existing assessments such as an early assessment or a Common Assessment (CAF) in respect of the child. Any information they have about the child's developmental needs and the capacity of their parents and carers to meet these within the context of their wider family and environment should be provided as a part of the referral information. Such early help assessments should identify what services the child needs and why the child and family require further support to prevent the concerns from escalating to the child needing statutory services. The interagency early help assessments should be undertaken by a Lead professional acting as a coordinator of support services and as an advocate for the child. Local arrangements should be in place to promote effective early help assessments and services. The referrer must always have the opportunity to discuss their concerns with a qualified social worker. Local authority children's social care should make clear in their local area how this should happen as local arrangements vary for receiving referrals. Some Local Authorities have arrangements in place to screen referrals via a multi agency safeguarding hub process usually referred to as the MASH. Within one working day of a referral being received, a qualified social worker and their line manager must make a decision about the course of action to be taken. The social worker will need to make a professional judgment as to what type and level of help and support is needed, record this and feed back in writing to the referrer and the child and their family. The impact and influence on the child of wider family, community and environmental circumstances . Transparent and open to challenge. In all assessment processes, the safety of the child should remain paramount at all times and in all circumstances. The child must be seen by a qualified social worker as soon as possible following a referral. Professionals involved with the child and family must make a decision on the timing of this meeting, based on their assessment of the child's needs. The child's wishes and feelings must be taken into account when deciding what services to provide. It is important that the impact of what is happening to a child is clearly identified and that information is gathered, recorded and checked systematically, and discussed with the child and their parents/carers where appropriate. Early help, assessment and intervention are important because incidents of neglect and abuse within families are on a continuum and situations where abuse is developing can, at times, be resolved by multi-agency preventative services outside the child protection procedures. The set of principles for social workers working on child protection cases and care orders, where the child has links to a foreign country available in Working with Foreign Authorities: Child Protection Cases and Care Orders Departmental advice for local authorities, social workers, service managers and children's services lawyers July 2014. Assessments should, as far as possible, build on rather than repeat recent assessments and specialist assessments and have a clear purpose. All assessments should be updated and reviewed regularly for example when new information comes to light or prior to consideration of case closures. Where a local authority is assessing the needs of a disabled child, a carer of that child may also require the local authority to undertake an assessment of their ability to provide, or to continue to provide, care for the child, under the Care Act 2014.The Children and Families Act 2014 also includes duties for the assessment of young carers and parent carers of children under 18. The local authority must take account of the results of any such assessment when deciding whether to provide services to the disabled child. Under provisions in the Counter-Terrorism and Security Act 2015, local authorities have established Channel panels, which will assess the extent to which identified individuals are vulnerable to being drawn into terrorism or extremism and arrange for support to be provided to those individuals. Local authorities and their partners should consider how best to ensure that these assessments align with assessments under the Children Act 1989. In some cases where there are social workers employed by voluntary/charitable/private organisations undertaking assessments with children and families, they should be invited to share information in the best interest of the child to ensure that no aspects of significance are lost in safeguarding the child's welfare. Each local Authority will have local agreements in place for early help assessments such as the Common Assessment Framework (CAF). These are all based on an agreed set of principles and values and reflect the statutory guidance in Working Together 2018. The aim is to facilitate the access to appropriate services across local boundaries and different agencies. The London Threshold: Continuum of Help and Support document aims to provide guidance to explain how Local Authority Children's Social Care apply thresholds when making decisions about how to receive and respond to referrals made to them. Child Protection services – assessment and child protection enquiries to be undertaken by Children's Social Care (Section 47 CA 1989) with active involvement of other agencies such as the police, health professionals and education professionals. Local arrangements vary for receiving referrals as some Local Authorities have arrangements in place to screen referrals against the London Threshold: Continuum of Help and Support. Whatever the local route for a referral, it should be assessed by a qualified social worker and a decision should be made by the relevant line manager within the time scale of one working day about what should happen next. New referrals and referrals on closed cases should be made to the LA children's social care duty social worker. New information on open cases should be made to the allocated social worker for the case (or in their absence their manager or the duty social worker). Referrals should ideally be in writing unless a child is at immediate risk of significant harm. In these circumstances, referrals should be made by telephone without delay and the referrer should discuss their concerns with a qualified social worker. The referrer should outline their concerns and will be asked to provide information to explain what they are concerned about and why, particularly in relation to the welfare and immediate safety of the child. See 2.4.4 for details of the information that might be requested. The referrer should not refrain from making a referral because they lack some of the information as the welfare of the child is the priority. For all referrals to LA children's social care, the child should be regarded as potentially a child in need, and the referral should be evaluated on the day of receipt. A decision must be made within one working day regarding the type of response that is required. Local authority children's social care should ensure that the social work professionals who are responding to referrals are supported by experienced first line managers competent in making sound evidence based decisions about what to do next. Where available, the child's NHS number and education UPN number. At the end of the referral discussion the referrer and LA children's social care should be clear about proposed action, timescales and who will be taking it, or that no further action will be taken. Involving other agencies as appropriate (including the police if an offence has been or is suspected to have been committed and probation, if the child is at risk of harm from an offender). Whether there is any need for any urgent action to protect the child or any other children in the household or community. Referrals from professionals that have been made by telephone or in person should ideally be confirmed in writing, by the referrer, within 48 hours. If the referrer has not received an acknowledgement within three working days, they should contact LA children's social care again. The parents' permission should be sought before discussing a referral about them with other agencies, unless permission-seeking may itself place a child at risk of suffering significant harm. See Sharing Information Procedure about whose consent to share information should be sought. Interviews with family members and, if appropriate, with the child should also be undertaken in their preferred language and where appropriate for some people by using non-verbal communication methods. A decision to discuss the referral with other agencies without parental knowledge or permission should be authorised by a LA children's social care manager, and the reasons recorded. LA children's social care should make it clear to families (where appropriate) and other agencies that the information provided for this assessment may be shared with other agencies. This checking and information gathering stage must involve an immediate assessment of any concerns about either the child's health and development, or actual and/or potential harm, which justify further enquiries, assessments and / or interventions. The LA children's social care manager should be informed by a social worker of any referrals where there is reasonable cause to consider s47 enquiries and authorise the decision to initiate action. In most cases this will first involve an assessment, which may be brief when the threshold for child protection enquiries is met (see Child Protection Enquiries Procedure). If the child and / or family are well known to professional agencies or the facts clearly indicate that a s47 enquiry is required, the Local Authority should initiate a strategy meeting / discussion immediately, and together with other agencies determine how to proceed. The threshold may be met for a s47 enquiry at the time of referral, following checks and information gathering or at any point of LA children's social care involvement. The police must be informed at the earliest opportunity if a crime may have been committed. The police must decide whether to commence a criminal investigation and a discussion should take place to plan how parents are to be informed of concerns without jeopardising police investigations. The Police should assist other agencies to carry out their responsibilities, where there are concerns about the child's welfare, whether or not a crime has been committed. A s47 strategy meeting / discussion. A LA children's social care manager must approve the decision about the type of response that is required and ensure that a record of the outcome of the referral has been commenced and/or updated. 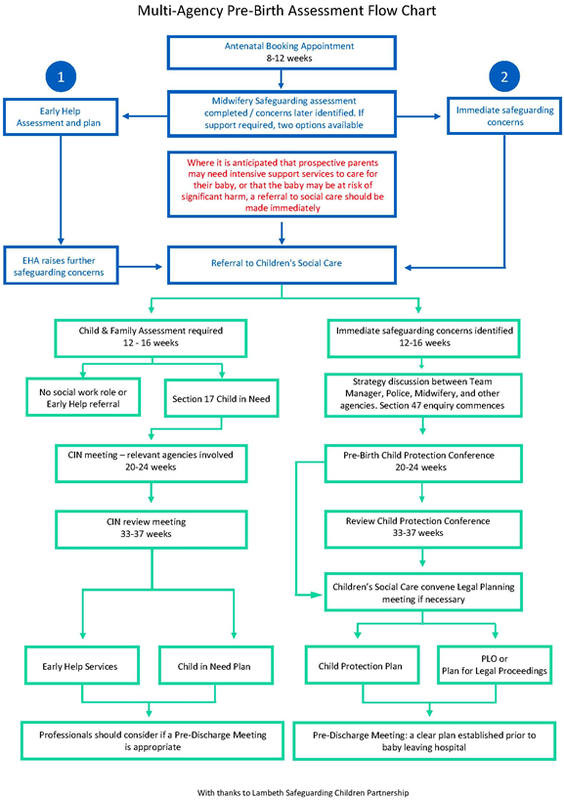 LA children's social care must acknowledge all referrals within one working day. It is the responsibility of LA children's social care to make clear to the referrer when they can expect a decision on next steps. The social worker should inform, in writing, all the relevant agencies and the family of their decisions and, if the child is a Child in Need, about how the assessment will be carried out or of a plan for providing support. Where there is to be no further LA children's social care action, feedback should be provided to the child, the family and referrers about the outcome of this stage of the referral. This should include the reasons why a case may not meet the statutory threshold to be considered by local authority children's social care for assessment and suggestions for other sources of more suitable support. In the case of referrals from members of the public, feedback must be consistent with the rights to confidentiality of the child and their family. The assessment should be undertaken in accordance with the relevant local assessment protocol based on the guidance in Working Together to Safeguard Children 2018. Where an early help or common assessment has previously been completed, this information should be used to inform the assessment, although the information must be updated and the child must be seen. The assessment must be completed in a timely manner as identified by the social worker and LA children's social care manager but should not exceed 45 working days from the point of referral. Where it becomes apparent that this timescale will require extension, a LA children's social care first line manager must review the file, record the reason for the extension and agree the new timescale. Local Authorities may have different local Assessment framework agreements in place which may contain timescales to be observed. Any timescale should be regularly reviewed. Whether information from abroad is required. If it is, then professionals from each agency will need to request information from their equivalent agencies in the countries in which the child has lived. See guidance in Working with Foreign Authorities: Child Protection Cases and Care Orders Departmental advice for local authorities, social workers, service managers and children's services lawyers July 2014. See Sharing Information Procedure, about whose consent to share information should be sought. The checks should be undertaken directly with the involved professionals and not through messages with intermediaries for example reception staff in GP Practices. All discussions and interviews with family members and the child should be undertaken in their preferred language and where appropriate for some people by using non-verbal communication methods. If during the course of the assessment it is discovered that a school age child is not attending an educational establishment, the LA education service where the child resides should be contacted to establish the reason for this. LA education must take responsibility for ensuring that the child receives education as soon as possible. Action must also be taken, if it is discovered that a child is not registered with a GP, to arrange registration. Depending on the age of the child the relevant community services named health professional should be contacted and action taken to arrange for the child to have access to all health services and an NHS number. What is likely to happen if nothing changes in the child's current situation? What are the likely consequences for the child? The answers to these questions should inform decisions about what interventions are required to safeguard and promote the welfare of a child and where possible to support parents in achieving this aim. An assessment should be planned in accordance with Local Assessment guidance / protocols in place and set out to aim to understand the child's developmental or welfare needs and circumstances and the parents' capacity to respond to those needs, including the parents' capacity to ensure that the child is safe from harm now and in the future. The assessment must set out the timescales and the child must be seen within a timescale that is appropriate to the nature of the concerns expressed at referral. The action points have been distributed to all participants. If the child and their parents have moved into the LA children's social care area, all practitioners should seek information from their respective agencies covering previous addresses in the UK and abroad. See also guidance in Working with Foreign Authorities: Child Protection Cases and Care Orders Departmental advice for local authorities, social workers, service managers and children's services lawyers July 2014. For information from foreign countries, see Accessing information from abroad Procedure. In some cases, specialist assessments and information can be undertaken or obtained through independent consultants or through specialist agencies such as International social services (ISS) and Children And Families Across Borders (CFAB). It is never acceptable to delay immediate action required whilst information from foreign countries is accessed. It will not necessarily be clear whether a criminal offence has been committed, which means that even initial discussions with the child should be undertaken in a way that minimises distress to them and maximises the likelihood that they will provide accurate and complete information, avoiding leading or suggestive questions. The police must be informed at the earliest opportunity if a crime may have been committed. The police will decide whether to commence a criminal investigation and should work jointly with the Local Authority. The police should assist agencies to carry out their responsibilities, where there are concerns about a child's welfare, whether or not a crime has been committed. Is this a child in need? (s17 Children Act 1989); if so, is there a need for further social work support or provision of support? Is this a child in need of, or requesting, accommodation? (s20 or s31 Children Act 1989). Every assessment should be focussed on outcomes, deciding which services and support to provide in order to deliver improved welfare for the child. Emergency action to protect a child (see Child Protection s47 Enquiries Procedure, Immediate protection). Given in writing to agencies involved in providing services to the child. Written feedback has been provided to the family, other agencies and referrers about the outcome of this stage of the referral in a manner consistent with respecting the confidentiality and welfare of the child. If the criteria for initiating s47 enquiries are met at any stage during an assessment a Strategy meeting/discussion should take place. If the assessment is that further support is required, a child in need plan should be agreed with the family and other agencies. This plan should be monitored and reviewed regularly in line with local standards but within a maximum of six months to ensure that the outcomes for the child are met. Where agencies or individuals anticipate that prospective parents may need support services to care for their baby or that the baby may have suffered, or be likely to suffer, significant harm, a referral to LA children's social care must be made as soon as the concerns are identified. See Responding to Concerns of Abuse and Neglect Procedure, Potential risk to an unborn child. The referrer should clarify as far as possible, using the local early help assessment arrangements such as the common assessment framework, their concerns in terms of how the parent's circumstances and / or behaviours may impact on the baby and what risks are predicted. "Where the local authority is considering proceedings shortly after birth, the timing of the sending of the pre-proceedings letter or letter of issue should take account of the risk of early birth and help to ensure that discussions and assessments are not rushed. Ideally the letter should be sent at or before 24 weeks." (p 19). Although not all referrals will go on to require legal proceedings, it is important to bear in mind the timescales laid out in the guidance as they will not be met unless referrals are made at an early stage in the pregnancy. Concerns should be shared with prospective parent/s and consent obtained to refer to LA children's social care unless obtaining consent in itself may place the welfare of the unborn child at risk e.g. if there are concerns that the parent/s may move to avoid contact with investigative agencies. A child aged under 13 is found to be pregnant (see Safeguarding Sexually Active Children Procedure and Safeguarding Children from Sexual Exploitation Procedure). The need for a s47 enquiry should be considered and, if appropriate, initiated at a strategy meeting / discussion held as soon as possible following receipt of the referral. The expected date of delivery will determine the urgency for the meeting. Consideration of the need to initiate a s47 enquiry should follow the procedures described in Child protection enquiries Procedure. The strategy meeting / discussion should follow the procedures described in Child Protection s47 Enquiries Procedure, Strategy meeting / discussion. It should take place at the hospital where the birth is planned or expected, or where the responsible midwifery service is or would be if the parents have not booked for service provision prior to birth. Any instructions in relation to invoking an emergency protection order (EPO) at delivery should be communicated to the midwifery manager for the labour / delivery suite. The parents should be informed as soon as possible of the concerns and the need for assessment, except on the rare occasions when medical advice suggests this may be harmful to the health of the unborn baby and / or mother. In undertaking a pre-birth s47 enquiry and assessment, LA children's social care, the police and relevant other agencies must follow the procedures described in Child protection enquiries Procedure. The factors likely to change, the reasons for this and the timescales. The enquiry must make recommendations regarding the need, or not, for a pre-birth child protection conference which should wherever possible be held before 24 weeks. See Child Protection Conferences Procedure, Pre-birth conferences.